The following is an article published by SCIENCE magazine. Two weeks ago, U.S.-based astronomers announced the discovery of the first Goldilocks planet circling another star: just the right size and just the right temperature to harbor alien life. 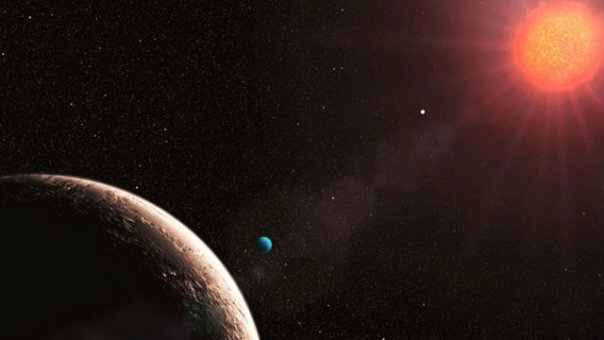 But yesterday at an exoplanet meeting in Turin, Italy, Switzerland-based astronomers announced that they could find no trace of the prized planet in their observations of the same planetary system. All the excitement has been over the subtlest of wiggles in the motion of the star Gliese 581 that lies just 20 light-years from the sun in the direction of the constellation Libra. A consortium of institutions led by the Observatory of Geneva in Switzerland had already discovered four planets circling Gliese 581 by sorting out the subtle motions of the star that are induced by the gravitational tugs of any orbiting planets. On 29 September, a U.S.-based team led by astronomer Steven Vogt of the University of California, Santa Cruz, announced that it had discovered a fifth planet. The American team used a combined set of observations: One 11-year-long set consisted of 122 measurements made by the team, while the other set was 4.3 years long and consisted of 119 measurements published by the consortium. Designated Gliese 581g, the new planet has at least three times the mass of Earth—large enough to hold on to a watery atmosphere—and orbits at a distance from its star that would allow any water to remain liquid. That would make 581g a happy home for life as we know it.